If you're looking for a great lakefront getaway you've come to the right place! 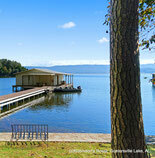 Our beautiful lakefront homes have everything you need for a great Lake Guntersville getaway. Whether you're coming to fish, relax or spend time on the water, you only need clothes, personal items and food - we've got the rest covered! - Stand alone beds - no bunk beds in our homes!